Published: Nov. 11, 2015 at 01:07 p.m. 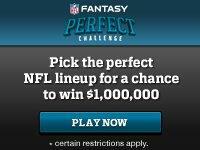 Updated: Nov. 11, 2015 at 02:09 p.m.
Each week, you can try to predict the perfect fantasy lineup on NFL.com for a chance to win $1 million. Never played before? Don't worry, it's super simple and completely free. All you have to do is select who you think will be the highest scoring player at each position in a given week. Easy. And it gets better. Each week I'll collect the perfect lineup from each of our fantasy experts to try and help guide you all to the $1 million prize. Haven't joined NFL Perfect Challenge yet or bothered to play? Don't worry, you can get started in just a few seconds RIGHT HERE. Below are the Perfect Challenge picks for Week 10 from Marcas Grant, Matt Franciscovich, Alex Gelhar and myself, Matt Harmon. Tom Brady is a fairly obvious pick for anyone at quarterback on a week-to-week basis. DeAngelo Williams is a perfect candidate for this game. After totaling 225 yards and two scores against the Raiders, Williams could put up a similar performance against the woebegone Browns run defense. Mark Ingram saw 26 touches last week, but finished under 10 fantasy points, Marcas makes a wise choice in banking on that to reverse a bit. I'm not so sure Dez Bryant has the ceiling with Matt Cassel in tow to be the top scoring wide receiver of the week. On the other hand, Cassel did seem to figure out last week you just put the ball up for Dez and let him do the work. The matchup with Tampa Bay is right for the occasion, too. Another Bryant and Williams lineup. Again, these two are fine picks for the game this week. Lamar Miller is a fine choice as the RB1, and he's finished inside the top two scorers two of the last three weeks. 14 touches is Miller's low mark under the Dan Campbell led Dolphins, and he's seeing the guaranteed volume needed to push for RB1 overall status. He's also a tremendously talented player who can break a play at any point in the game. Cam Newton faces a Tennessee pass defense that just allowed Drew Brees to go for well over 300 yards and four touchdowns. While the script isn't set up perfectly for him this week, Newton was the highest scoring passer just last week and has that very tangible ceiling in any given outing. Surprisingly, this is our first Todd Gurley lineup. Gurley didn't have his best game in Week 9. He is, in fact, human. However, all signs point to another blowup game for him in Week 10. The Rams are back on the fast track of their home dome, and welcome the Bears to town. Chicago gives up a healthy amount of ground to effective running backs. Last week was Gurley's most impressive outing as a pass catcher, and the Bears just let Danny Woodhead go for 6-78 and a touchdown grab on Monday night. A.J. Green is an interesting choice, as he's coming off a stretch where three of his last four games went for under 80 yards and no scores. The Texans have struggled to cover big, outside wide receivers the last two years, and it could be Green's turn to dominate this week. The target distribution is just so hard to trust right now in Cincinnati right now, however. Of course Gelhar went with a stack of his beloved Packers, but it's a strong call this week. We haven't seen Rodgers or this passing game light up the scoreboard regularly this year, as they've gone to more of a quick-hitting attack. However, the Lions defense bleeds yards after the catch. This could be a massive week for Rodgers and Randall Cobb. Three out of the four of us went with Allen Robinson, but I saved to talk about him in my section (obviously). Robinson just went for 122 yards in a tough matchup, and now maces a duel with the Ravens, who allow the second most yards per game to the receiver positon. Robinson sees 26 percent of the targets in an aggressive, pass happy offense. If you didn't know about him yet, this will be the week you recognize him when he goes nuclear on Baltimore. Speaking of nuclear, Odell Beckham is always a candidate for that title. Last week was his highest target total of the season, as the Giants finally adapted the Just Throw It To Your Good Players philosophy. If that's going to be a weekly plan, Beckham will push for this top spot every game, and especially in a matchup with the Patriots that will feature plenty of scoring. I was the lone writer to pick the Rams, but I think they're a no-brainer for the top spot. Jay Cutler hasn't had a meltdown game yet this season, and it may not come, but if it was going to happen, on the road against the Rams defense makes for a perfect spot. Anyway, that's how we're rolling for Week 10. We aren't in this for ourselves though. We are men of the people. We want you to use our picks to make your own perfect lineup and come away with the $1 million prize. So what are you waiting for? Sign up for NFL Perfect Challenge and prove that you're indeed smarter than all of us. We will gladly celebrate with you if and when you take home that grand prize. Please keep us posted.